Today I thought it would be a good idea to dive into how I use my Xacto or craft knife. Since I'm trying to make these posts short and sweet, I think this tool will require future visits to offer more info—after all it is my best friend (after my MacBook)! 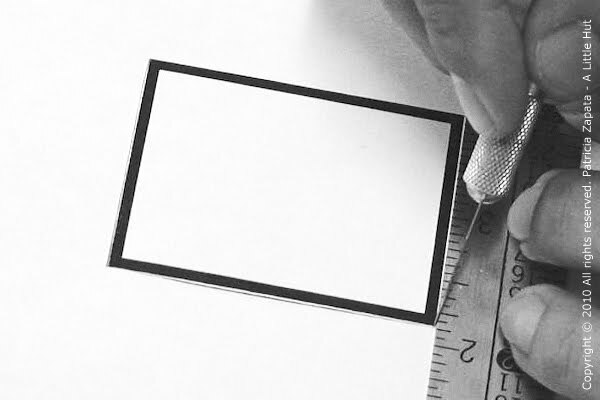 When I'm cutting and I need to use a ruler (always metal, never plastic) I place it over the piece I'm cutting out. 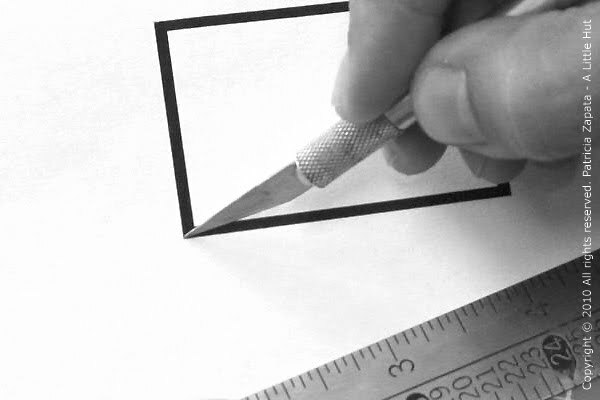 If the blade slides off in a direction that I didn't intend for it to go it won't ruin the piece of paper I'm working on. Never leave any borders showing on the final piece. 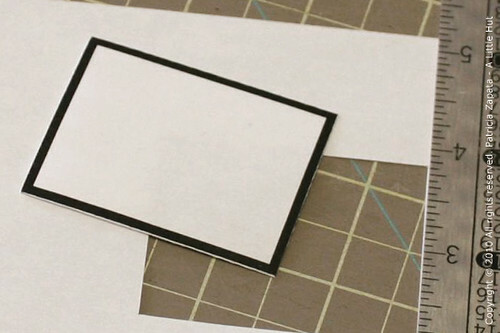 For the purpose of this example, I'm cutting out the rectangle and leaving the frame as my final piece. I used an extra thick border so that it would be more visible in the photos. 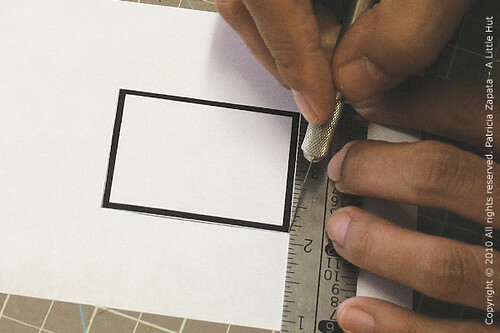 Place Xacto just outside of the outline and sink it into the paper. 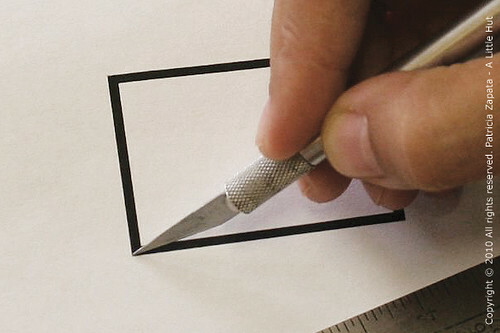 Slide the ruler against the blade and line it up with the rectangle. Remember my ruler is protecting the final piece or frame in this case. 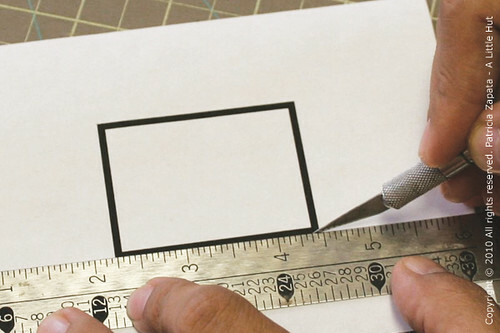 Cut the long side of the rectangle. Do the same for the three remaining sides. The shape is completely cut out and there are no black borders left on the frame. If you look closely you can even see a very thin white line just outside the black border. If measurements aren't a concern, I do leave that white border to make sure I won't have any black marks on the final piece. Typically the outlines I work with are hand drawn and made with pencil, but I still work the same way. Even though pencil markings can be erased and I draw lightly, they still leave the marks behind. I don't even want to recall how many times using an eraser has ruined a piece of paper. 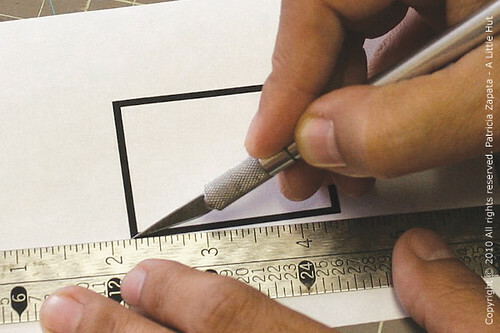 The safest bet is to eliminate markings of any kind during the cutting process. Does the blade really have to be that sharp? My answer is no (no tomato throwing please!). I actually prefer a blade that has gone through some paper already. Even though cutting through something like it's butter feels great, I prefer to have a duller blade. I feel like it's more under my control. The trick is knowing when dull it too dull. So, when is a blade too dull? 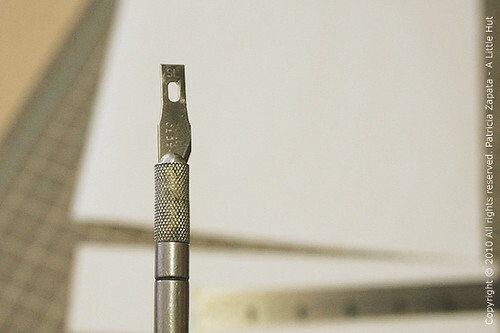 If I can cut a sliver of paper (and I mean less than 1/16" wide) off a scrap piece of the same paper I'll be using, then a blade is still good to go. If it catches the paper and wrinkles or tears it, I know it's time for a new blade. Craft knives come with little covers that I always lose. My solution? I pull out the blade and store it with the pointy side towards the handle. I've done this for years—Easy! Please note that this is how I do things. If you have better and easier ways to work, stick to them—and please feel free to share your thoughts in the comments section. Remember this is all, as the title indicates, intended for beginners and mostly taken from questions I get in emails. I hope it helps.